Why Do My Yellow Squash Turn Brown and Shrivel Up? Yucca is actually a family of several species of perennial plants of the southern regions of the United States and throughout Mexico, Central America and northern South America. Producing large stalks of beautiful and fragrant flowers, yucca plants are an impressive addition to landscapes in arid conditions where the plant thrives. The flowers are not only pretty, they are also edible. The yucca plant produces large sprays of sword-shaped leaves that grow densely in whorls from the ground or along a long stalk or trunk, depending on the species. The flower head is usually large, often exceeding 3 feet in height and 2 feet in width and consists of a single upright stem with radiating clusters of creamy white blooms, often tinged with purple. Each blossom is around 2 inches long and tulip-shaped with six pointed, downward-facing petals. In 1927, the legislature of New Mexico adopted the choice of the state's schoolchildren, who selected the yucca flower as the official state flower. Yucca is prolific in New Mexico and, while no species was specifically named, it is accepted that the official flower is either the Yucca elata, or soaptree yucca, or the Yucca glauca, or soapweed yucca, according to the Santa Fe Botanical Gardens. Early American settlers, who took note of the large and impressive flower heads, called them "Lamparas de Dios" or "the Lamps of God." The yucca plant reproduces through a symbiotic relationship with moths of the genus Tegeticula, more commonly called yucca moths. These moths specialize in using the flower of the yucca plant to complete their life cycle and, in the process, pollinate the plant. When yucca plants bloom, mated female yucca moths will enter a yucca blossom and intentionally collect pollen stems, called pollinia, forming them into a ball. The moth the flies to yet another blooming yucca plant and enters a blossom to lay a single egg in the flower's ovary. The moth then places the ball of pollinia on the stigma of the flower to pollinate it. This ensures that seeds will form, which not only reproduce the plant, but also act as food for the moth larva within the seed pod. 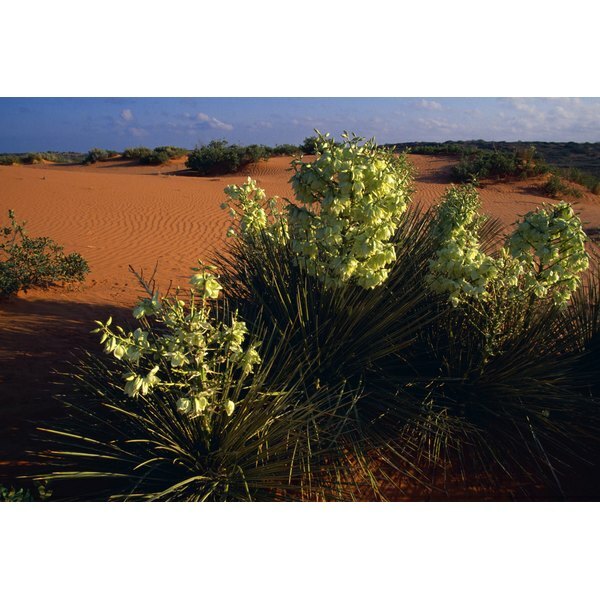 Yucca plants require hotter conditions and dry, sandy soils to produce blossoms. During the days, the flowers droop toward the ground. As the evening cools, the flowers turn upward, producing a pleasant fragrance that is attractive to both people and yucca moths. Typically, yucca bloom in the spring and early summer. At this time, yucca moths are just emerging from their cocoons, where they have changed from larvae to adult moths. The yucca blooms coincide with appearance of the moths to ensure proper pollination. Yucca are among the many flowers that are safe to eat. The Colorado State University Extension describes the taste of yucca flowers as slightly bitter, with a hint of artichoke flavor. The flowers can be eaten both raw or lightly sauteed. The wild flowers of yucca also serve as forage for mule deer, pronghorn antelope, birds and other wildlife species.